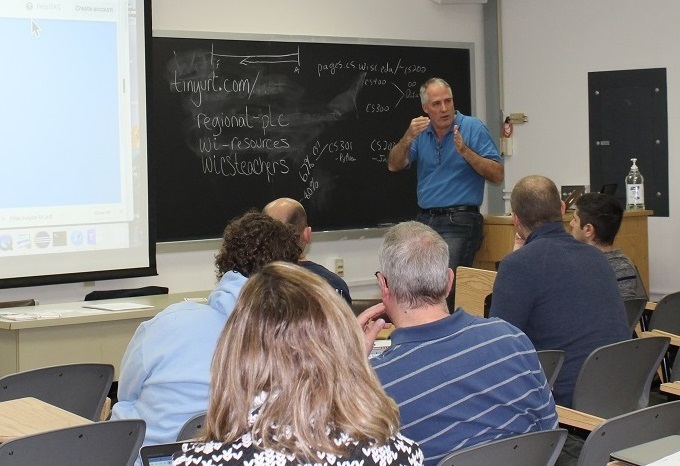 Over 30 high school computer science teachers from around the state attended a symposium on January 9 hosted by Faculty Associate Andy Kuemmel. The focus of the symposium was “Preparing Your Students for Success as a CS major.” This was a rare opportunity for CS high school teachers, not only to learn about helping their students prepare for college, but also to collaborate, share ideas, and network, all important for effective teaching. Based on the high turnout and the participants’ desire for more collaboration, Kuemmel plans to hold the symposium each year. The CS department was also represented by Faculty Associate Jim Williams and Undergraduate Advisors Brittany Elandt and Mollie Stolbov, who gave short presentations about the department’s efforts to help incoming students succeed in the major. “Teachers in high school, and even at earlier levels, want to broaden participation in computer science. The UW-Madison CS department can provide content knowledge, guidance, and mentoring for these teachers.” In keeping with the Wisconsin Idea, Kuemmel hopes this symposium will lead to more formal outreach events in the future.